Mumbai: Ratan Tata took a sip of water on Monday to announce the next big innovation of the salt-to-telecom conglomerate he heads: a 2ft high purifier that promises to provide clean drinking water in a country where three out of four villagers do not have access to it and where an estimated 400,000 children die every year from diarrhoea. The launch of Swach—Hindi for clean—was a low key-affair compared with the high-profile launch of the low-cost Nano car on 10 January 2008, when Tata had said that his next big dream was to provide safe and affordable drinking water to millions of Indians. It was a declaration of intent that got lost amid the excitement over the launch of the world’s cheapest car. “I am still standing," the 72-year-old Tata said after he sipped water, even as the audience burst out laughing at NCPA, a theatre in Nariman Point in south Mumbai. A senior Tata official said that the new consumer product would be available in two variants, priced at Rs749 and Rs999 respectively. Swach is the result of a four year quest that involved several Tata group companies and innovation labs, including Tata Chemicals Ltd, Tata Consultancy Services Ltd (TCS) and Titan Industries Ltd. Scientists from the Tata Chemicals Innovation Centre and Development Centre and TCS Innovation Labs have used rice-husk ash to filter out bacteria and nano silver particles to kill germs that lead to several water-borne diseases. Tata Chemicals and TCS, have between them applied for and got 15 patents for various technologies that went into the device. Tata Chemicals’ managing director R. Mukundan said the company will partner with other Tata firms such as Rallis and even non-profits to distribute and market Swach. The firm plans to sell a million units a year initially and ramp up to at least three million units a year in the next five years. Tata Chemicals will invest Rs100 crore to build manufacturing capacity at Haldia in West Bengal. The Tata group’s strategy to cater to the bottom of the pyramid is now part of management folklore. Quiz him on whether this is the cheapest gadget available for safe drinking water, Tata says he does not believe the quest was to develop the cheapest product. What drove the group was to develop a low-cost product that will reach the masses and is affordable to many people. One product that uses a different technology but competes in the same space for safe drinking water is Hindustan Unilever Ltd (HUL), Pureit which is priced at Rs2,000 a piece. Paddy-husk ash is available in plenty (20 million tonnes) in India. Right now, Swach can only prevent bacteria but other problems associated with drinking water in rural Indian households such as arsenic and fluoride contamination in water still cannot be treated by this device. Work is ongoing, promised Mukundan, who earlier at an editors’ conference alluded that four more variants of Swach were in the pipeline. The five questions posed to the scientists at the Tata Chemicals Innovation Centre were whether safe drinking water could meet tough US Food and Drug Administration standards, whether safe drinking water could be provided to consumers at the point of consumption, whether drinking water could be delivered to homes that do not have running water and electricity, whether the technology could mimic nature as closely as possible, and could it be as simple to use as an electric bulb. Group company Titan stepped in to design and make the machines and Tata Teleservices provided the marketing plan. The aim is to manufacture and sell one million sets in the first year, an ambitious target as HUL has sold four million sets in four years. The Tata group will use Tata Chemicals and Tata Kisan Kendras to sell the device to rural households. Tata Chemicals vice-chairman R. Gopalakrishnan, who was involved in the project, gave an inkling about the surfeit of technology and human capital available within the group. “If only Tata knows what Tatas knows," he quipped. 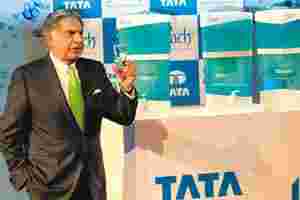 Ratan Tata later in the evening mentioned the “long and expensive journey" the group has traversed. “All over the world, technology is inter-disciplinary. No longer can we work in technological silos in this world," he said. “The day we make it work, we will reach a plateau of excellence," he added. Shipra Saxena, the India programme officer for British charity WaterAid, welcomed the filter’s launch. Asked why private companies were providing a basic service normally carried out by governments, she told AFP by e-mail: “Every player has some role to play. That is why the public-private partnership has gained prominence. “The government is doing appreciable work but then the scale is a problem... private players can pitch in." Phil Hazlewood of AFP contributed to this story.